Its nearing the end of summer. August is 1 week away from being over, and sad to say so is Good Karma. Just what have I been doing for the last 6 weeks? The people behind the scenes of San Diego’s beloved Kung Food, have another project in the works! 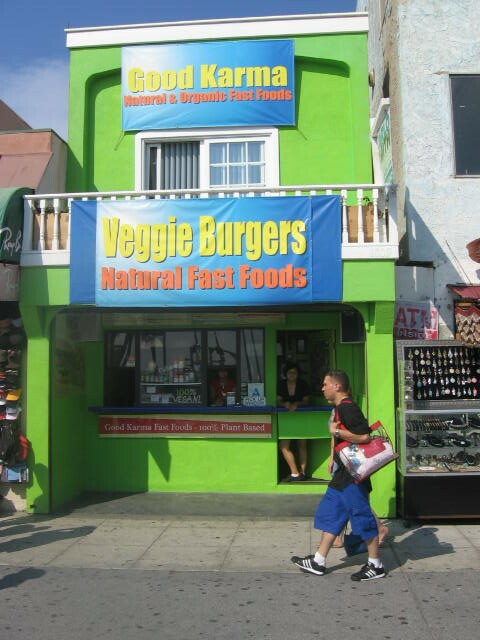 As most of us are very familiar with the KF drive thru, we have also had a sister location on the Venice boardwalk. 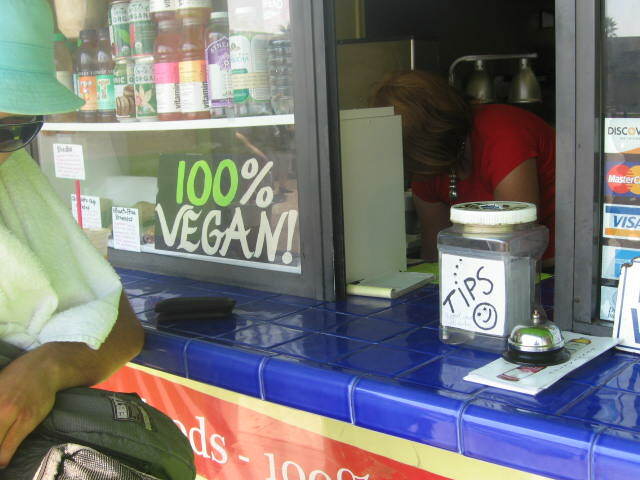 Serving the most amazing vegan fast food, such as Soy Chicken Chipotle sandwiches, Pesto Burgers, Chili Cheese Fries, Homemade Ice Cream & Mylk Shakes! And more importantly, perfect for aging men and women who want to see a change in their diet, or maybe even their kids’ but don’t know where to start. Sad to say that Good Karma will be leaving the boardwalk, closing its doors August 28th. We will be relocating to La Brea, and Olympic, mid-city LA. We’re hoping it’ll be a fast change, and our loyal customers, some who drive from west LA to east LA, 4 times a week in LA traffic (ugh!) will still come out to visit. So as for the future of vegan fast food? Well, the owners are changing the name to Nature’s Express. And this is just a start…. The grand opening of our Yuma, AZ. location should be in mid-September. Anyone wondering “Why Yuma?” I said the same. But after spending 2 weeks in Yuma, it was pretty apparent. People there have not one single option for healthy foods. And, they need it. More so than LA, maybe even more so then SD. The local folks there seem to rarely cook for themselves, and corporate America has made this small town a huge fast food community. People eat drive thru food for breakfast, lunch and dinner. So why not get them thinking about a healthier option! I just hope I last through the heat! 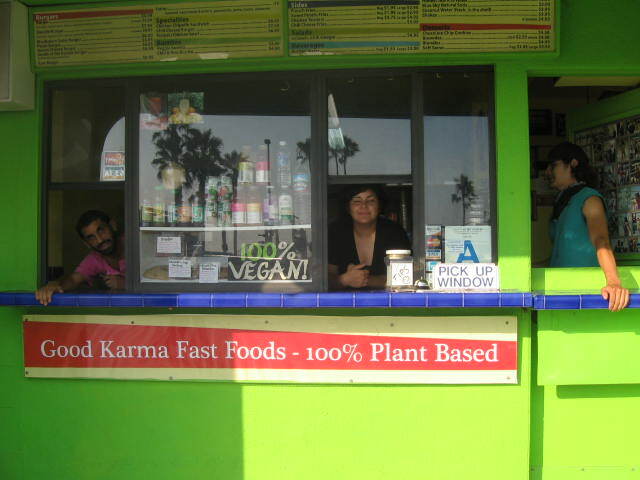 Heres a great pic from the Good Karma pick up window! This place will sure be missed! Till the next episode in veggie adventures….. 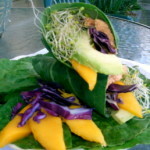 This entry was posted in Restaurant Eats, Summer and tagged evolution, Natures Express, san diego. When is the one in San Diego opening?!?!?!?!? We miss that drive thru so much! When will the mid city LA testaurant be opened. Why did Venic close down? Venice was a hard location for us. Until then, hopefully we will have a new San Diego location in the works early 2008! I will keep posting any new news I hear! I just relocated to Desert Hot Springs (around Palm Springs, CA) and found some of your stuff at Clarks. Yummy!!! Do you folks know of anything in this area? Just wanted to say awesome site. You have a new reader and I will be sure to come back.